"the leading scientific membership organization advancing the science-based understanding of the causes, consequences, prevention and treatment of obesity in order to improve the lives of those affected." has finally weighed in on soda taxes. "Countries across the globe have generated headlines recently over their efforts to tax sugar, tobacco and alcohol products. Even though tobacco and alcohol taxation has helped to reduce consumption and save lives, these beneficial effects have not yet been proven for taxing sugar-sweetened beverages (SSBs)." "Although taxing SSBs might generate revenue that can be used to promote other healthy food items, the net outcome may not necessarily decrease overweight and obesity rates in the United States or worldwide"
It's a bizarre press release. 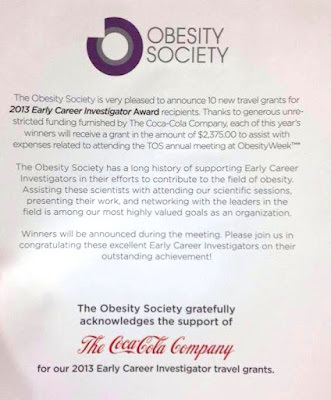 It is either ignorant, or purposefully disingenuous, of Heymsfield and TOS to frame soda taxes as if they hinge on obesity and put forward the straw man that a singular intervention is unlikely to have a remarkable impact on global weights. Complex problems tend not to have simple, singular solutions - it's the, "but that single sandbag won't stop the flood" argument, and truly, it's breathtakingly dense, especially in that reducing the excessive consumption of sugar-sweetened beverages is desirable for people at any weight and is the explicit aim of the tax with a secondary aim of raising funds to support other public health initiatives. Regarding potential health risks of soda taxes and the need for more research before considering, the data is quite clear (which is why the soda industry is fighting so vigorously against them), sugar-sweetened beverage taxes decrease sugar-sweetened beverage consumption and increase healthier beverage consumption while providing the greatest potential health benefits to low income consumers. "to promote innovative research, effective and accessible care, and public health initiatives that will reduce the personal and societal burden of obesity"
Suffice to say, I have yet to regret my decision to resign my membership in The Obesity Society, and I can't help but wonder whether this press release and stance will be the last straw for others.